$65 three-day passes to Music Fest 2013 are now on sale. Get them here. The $65 passes will run out very quickly, so don’t delay if you want to purchase. National Geographic has named Memphis one of 20 must-see places. Only four of the twenty places are in the United States. This week the Monday Lunch Club visited Bleu and tried their BYO sandwich and pasta menus. Here is their review. The MBJ posted a look inside the Chisca Hotel, a photo gallery of 15 images. The hotel is in pretty bad shape, but it least it’s still standing. 1) Make sure you have your ID in a place where you can get to it easily. If everyone has their ID out and ready, the lines at the bars’ doors will move quickly. 2) Try to bring cash to pay for your drinks. Imagine 700 Santas all trying to tab out with a credit card at once. 3) Don’t forget to bring a toy for Porter-Leath (no stuffed animals). If any Santas want to pre-game for the pub crawl, the Green Beetle is offering happy hour specials from 5 to 7 tomorrow for those in costume. If you want to pre-game SUPER early, a number of Santas will gather outside the Pyramid at 8 AM tomorrow. They will be cheering the marathon runners and handing out high-fives. You’re welcome to put on your costume and come join. Every year I say to myself, “That’s it, I’m done with Stumbling Santa, I don’t want to deal with the crowds and the 74 bazillion people who want to take a picture anymore.” And then by the next year I realize the event is a lot of fun and supports a good cause, and I put on the costume again. I’ll be at the Saucer dressed in whatever of my Santa costume has survived at 7 tomorrow night. Tonight is South Main Trolley Tour from 6 to 9. Weather is unusually nice for the end of November, so I’ll probably head south about 7:30 after a few warm-up beers at the Saucer. The St. Jude Marathon is this Saturday, December 1. That means the streets of Downtown and Midtown will be clogged with runners in the morning and early afternoon. Action News 5 has a list of streets on which you can expect traffic delays, and at what times. Saturday is also the 8th annual Bob & Roland’s Stumbling Santa pub crawl, where participants dress up as Santa and stumble around the Flying Saucer and Beale Street. The MemphisWeather.net forecast has a high of 69 (other sources are going as high as 74) and a low only in the mid-50s that day. Yikes, that’s going to be kind of warm for Santa suits. Bring a toy to the first stop, the Flying Saucer (7 PM), for Porter-Leath (stuffed animals not allowed for health reasons). The stops after the Saucer are a secret this year, but I got a sneak peek last night on the condition that I don’t post the list to my blog or social media. I’ll say that it’s a pretty good lineup, and the Saucer is probably the smallest venue on the list. Since 700 Santas are expected, that’s a good thing. Mayor Wharton will re-open Madison Avenue Downtown at 1 PM today. It’s been partly blocked since March 2011 due to a building collapse. Beer news: Archaeologists have discovered a 3500 year old microbrewery in western Cyprus. I wonder if 21st century brewers will attempt to re-create the recipe, as Dogfish Head did with Midas Touch? Tigers vs. UT Martin at 7 PM at FedExForum. Tarik Black will not be playing tonight. I hope we don’t lose again. Earlier this year, the City Council and the Tennessee House of Representatives designated Highway 61 and all of Third Street in Downtown as the Memphis Blues Trail. Friday at 1 PM, the first Blues Trail marker will be unveiled at Third and Gayoso, the site of a blues-inspired mural collection by local artist George Hunt. Mr. Hunt will be on hand for the unveiling, and there will be live music by Blind Mississippi Morris and Brad Webb. LaunchMemphis will hold a special 48 Hour Launch, Women’s Edition December 7-9. The idea of 48 Hour Launch is to completely get a new business up and running in the course of a weekend. This special edition will focus on empowering more women through our entrepreneurial ecosystem. Although women’s businesses will be launched, all (women and men) are invited to get on board and be a part of the development team. Your skills are needed. For more info and tickets to the event, go here. Good article on the New York Times site on How Costco became the anti-Walmart. So wait, it really is possible to provide a decent wage, decent treatment, and health insurance to employees while running a profitable business? Whaddaya know. The article speaks well of Costco’s thoughtful inventory selection and excellent customer service too. If you must shop at a big-box retailer this holiday season, don’t drive across the bridge to West Memphis Walmart… visit a retailer that takes care of its employees. Also on the NY Times site, the FiveThirtyEight blog has an analysis of why the technology talent gap in Silicon Valley and other tech centers may hurt the GOP in the future. Posting this for my fellow Arkansas fans to see: Petrino’s a snake but some win-starved program will let him in the house. Unfortunately this is true. It’s also why Bruce Pearl will have a head coaching job at some university in about 18 months. Good luck to whomever hires Petrino, and please don’t issue him a company motorcycle as part of the benefits package. Home from my two mayorship bars. Time for sleep then back at it tomorrow. If you were planning on buying gift cards in the half-off sale the Majestic Grille had today, you’re too late. They sold out shortly after noon. Thank goodness I ran into one of my neighbors last night at the Blind Bear and gave him some money to buy me cards. Have you heard good things about Bleu’s Build Your Own (BYO) Burger, but have not been able to try it because you’re never Downtown for lunch? Now you’ll have your chance. The restaurant has announced that from tip off to halftime of all Grizzlies home games, the BYO Burger will be on the dinner menu. I can personally attest that this is worth a trip to Bleu, although the sandwich I built was a sirloin sandwich rather than a burger. That’s all for now. Working on a post for the poker blog about game theory as it relates to poker games in bars. May be back tonight with an additional news post. 4. Select your seats and tickets will be emailed to you. No Ticketmaster fees. Contact Carl Rosen at 901.205.1445 or via email at crosen@grizzlies.com if you have questions about the Downtown Night promotion. If you plan to go, you can “join” the Downtown Night Facebook event listing to let your friends know you are attending. Reservations are recommended. Call 901-522-8555 to make them. Rates for American Queen riverboat cruises will go up $200 in the coming year. That will make prices start at $1345 per passenger, based on double occupancy. According to the MBJ article linked here, cruise sales are way up compared to last year. Glad to see the riverboat company doing well. The parking garage at 147 Jefferson is being demolished. It’s the first step in renovating the building next door, a 12-story building at the southeast corner of Second and Jefferson. The developer hopes to put businesses related to the courts in the first two floors, with apartments for seniors above and possibly event space on the top. Home after a night at the bars. Eating leftover Aldo’s Pizza, then sleep. Hopefully back at lunch tomorrow with a new post. Final reminder: 50% off gift card sale at the Majestic Grille tomorrow. Buy gift cards in increments of $50 for $25. Sale is from 8 AM until they run out, and you must buy in person. There are some restrictions – can’t redeem until after January 2, can’t be used for alcohol or gratuity – but the cards are still a fantastic deal. In case you haven’t already heard, Conference USA 2.0, er, I mean the Big East, will announce today the addition of Tulane (all sports) and ECU (just football). A bomb threat was called in for three Downtown buildings this morning. Two of the buildings were evacuated and searches conducted at all three. Nothing was found. Awesome blog post today by Eric Mathews of LaunchMemphis. Let’s say that you have an idea for a killer mobile phone app or web app, but you aren’t a techie. So you need to partner with a developer. You approach several developers, lay out your pitch, and one after the other they tell you, “No thanks, not interested.” This post explains why. As a techie/developer who has been approached with these kinds of startup projects before, I can tell you that Eric NAILED it in his post, and he will tell you what you need to do differently. By the way, did you know that LaunchMemphis has FREE office hours for people who have an idea for a startup business and need help getting it off the ground? All right, short post today because I need the rest of my lunch break to run a couple of errands. I’ll be out somewhere tonight, exactly where TBD. I’ve been hearing good stuff on Twitter about a really good blog called Confessions of a Volunteer, but I hadn’t had time to check it out. Today I did while eating a Frosty for lunch, and it’s really good. It’s written by a woman who is volunteering at 30 different Memphis nonprofits and charities, and writing about her experiences. It really introduces the reader to the rich depth of volunteer opportunities in our city. If you have been thinking about volunteering but you’re not sure where you’d like to pitch in, Confessions of a Volunteer will give you plenty of ideas. There’s a Groupon available this week to see the Harlem Globetrotters on Saturday, January 12 at 7 PM. There are two options, for $31 and for $50. Go here to get the deal. Running the Memphis Marathon Saturday? Here is a list of restaurants serving Friday evening carb-up specials to runners. Central BBQ has announced that they are extending the $10 rib special until Christmas at the Downtown location. If you’ve seen me around Downtown this month, you may have seen my two new beautiful Pink Pig fleece jackets from Shelton Clothiers. Based on a Facebook post I saw today, it looks like they’ve added some new colors. Current color selection includes cream, charcoal, red, and olive green. Tom Shelton has pointed out to me several times that the red ones could be considered Razorback red. They’re $79.50 each and Shelton has a buy one, get one half off special until the end of November. The fleeces are medium-weight and will keep you warm down to about 45 degrees. 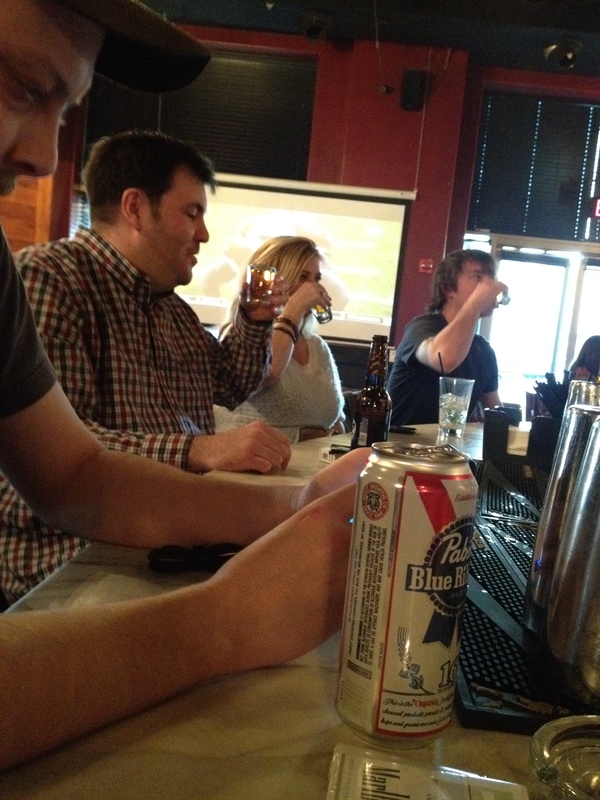 Bardog Tavern is reviving its weekly Wednesday poker night. They have ordered 14-gram denominated chips and new double-indexed Copag cards. Start time is 7 PM in the Underdog room. If you don’t want to wait until Wednesday to play poker, Muruako hosts a game tonight at the Silly Goose, 8:30 PM. Going to heat up a slice of Aldo’s pizza then head out to the bars. Undecided whether I’ll play poker. Lansky Bros. is having a Cyber Monday sale on their website today: $50 off any order over $150. You have to purchase via the website; no phone orders allowed. Use code CYBERMONDAY when you check out. Sale ends at midnight tonight. 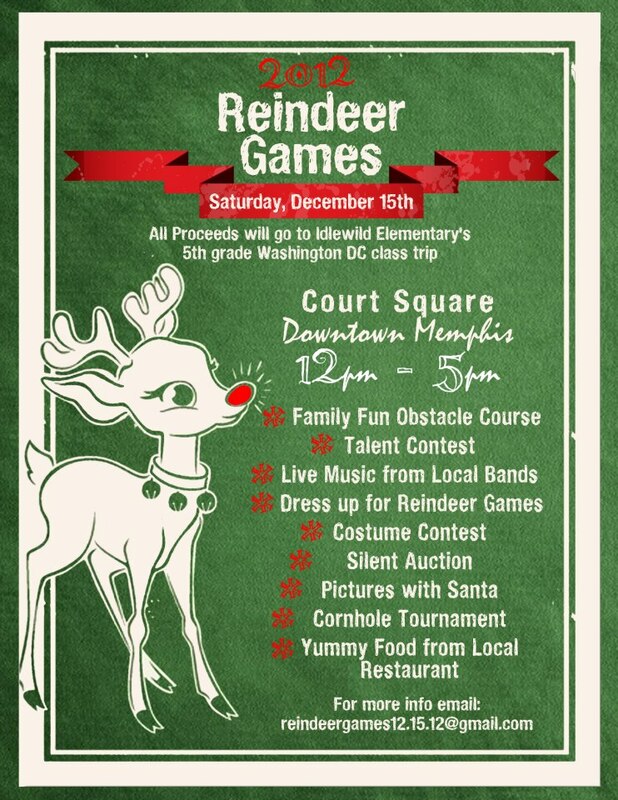 The event flyer for Reindeer Games, Saturday, December 15 in Court Square, has been posted. Here’s a copy of it. Per NBA requirements, the FedExForum will start hand-wanding all guests for security purposes before 50% of all Grizzlies games through the All-Star Break, and 100% of games after that. This will slow down lines to get in, so if you attend a game please plan on arriving a few minutes early. All three games this week (tonight vs. Cleveland, Wednesday vs. Toronto, Friday vs. Detroit) will use the wanding. Here’s a look at why I was 45 minutes late to work this morning. It’s not a good thing when you pass the scene of an accident and see that the police have laid a tarp over a car’s windows. That’s a sure sign there’s a dead body inside. I got past the wreck about 8:35 and by 11 they still had not cleared it. All right, that’s the news, now let’s recap the latter half of the long Thanksgiving weekend. 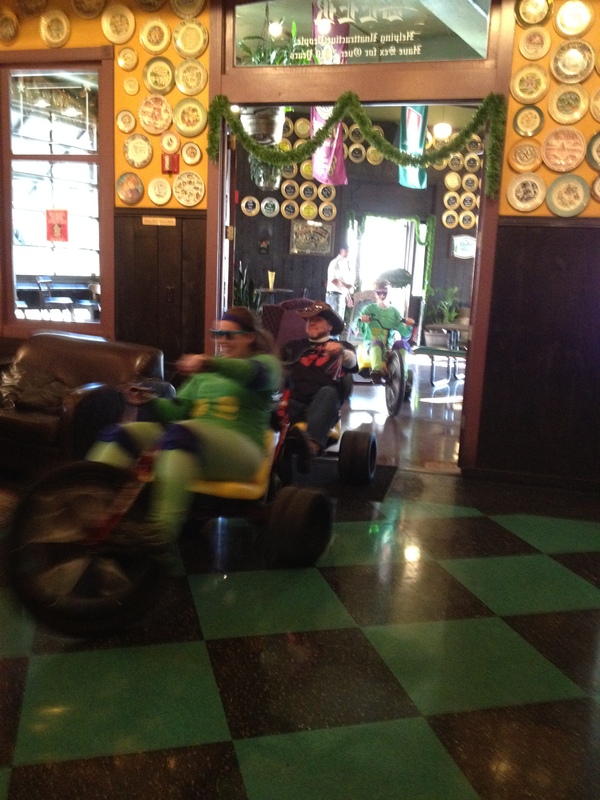 Saturday I was hanging out at the Flying Saucer when several people on adult-sized Big Wheels came in. They had been on Beale Street for the second annual Big Wheel Race, a fundraiser for the Salvation Army’s Angel Tree foundation. WMC-TV has a photo gallery of the race. They told me it costs about $600 to build a Big Wheel fit for adults. A suburbanite (center) explained to Buddha and Clay how much fun she has at Applebee’s, Chili’s, O’Charley’s, Home Depot, and TGI Friday’s. Apparently we’re missing out on a lot by not living in Olive Branch. 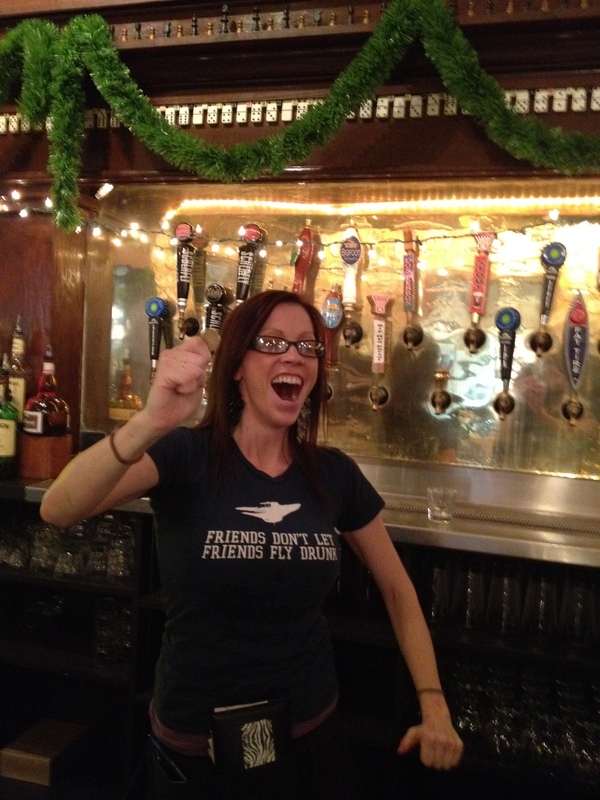 It’s too bad the suburbanite wasn’t at the Flying Saucer on Saturday. 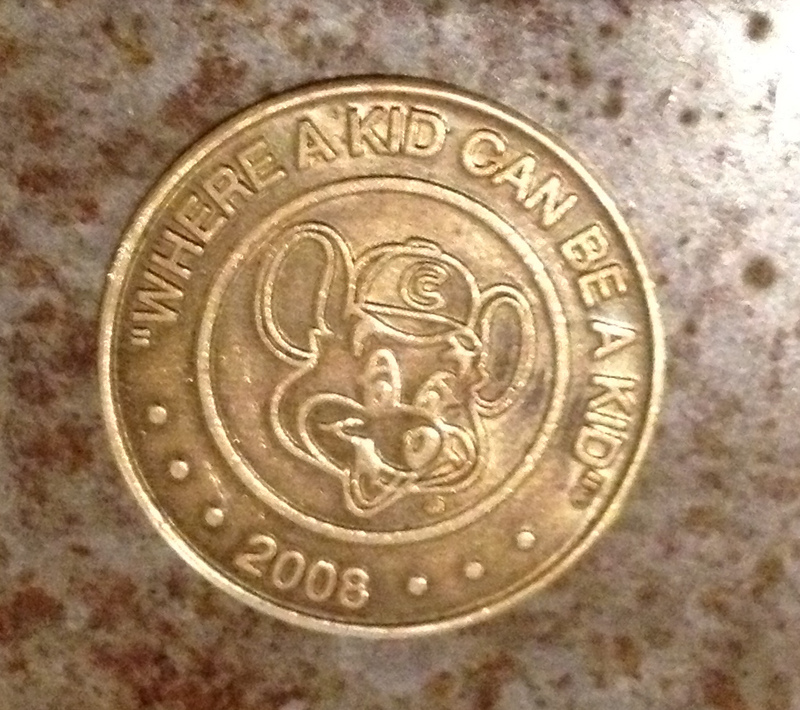 A game token was found for one of her favorite hangouts, Chuck E. Cheese. Before I could text the suburbanite and ask if she wanted the token, Tiffany claimed it. It’s not hard to imagine Tiffany having a good ol’ time in Chuck E. Cheese’s game room. Sunday after stops at Blind Bear, the Goose, and the Saucer, it was time to think about eating. I really didn’t feel like staying out longer, so I ordered a pizza to go from Aldo’s Pizza Pies. Instead of ordering one of the named pies on Aldo’s menu, I decided to go with the create-your-own option. 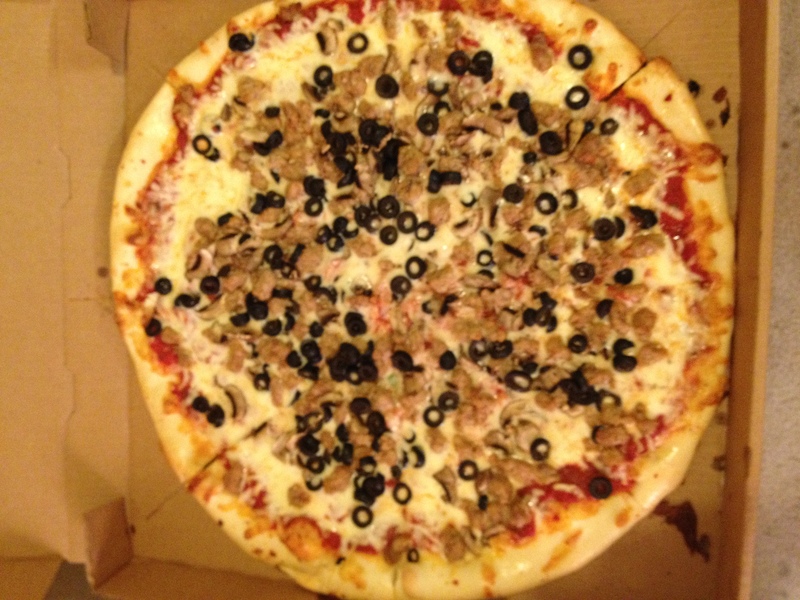 I got an 18″ pizza with extra cheese, sausage, black olives, and mushrooms. As the recently-deceased Mr. Food would say, “Oooohhh it’s so good.” I was very happy with my creation. I ate three slices, and put the rest in the refrigerator for tonight and tomorrow. Considering I get three meals out of it, Aldo’s pizza really isn’t any more expensive than eating out elsewhere Downtown. Plans for tonight: I’m going to keep with my habit of avoiding the Flying Saucer until after the Grizzlies game starts, since it tends to get crowded with people pre-gaming there. I’ll go to whichever of Blind Bear, Silly Goose, or Bardog looks best on Foursquare/Facebook at the time, then will migrate to the Saucer’s Pint Nite at 7. May be a second news post after work, so check back. Friday after Thanksgiving is one of the biggest sports days of the year. And let me tell you, between Memphis Tigers basketball and Arkansas Razorbacks football, I would have been happy to tune all the TVs in the bar to the Weather Channel. Actually, I didn’t watch the Tigers game, because if you want to get on a TV channel that most bars carry, it helps if you win games. I heard all about it on Twitter though. It reminds me of a story. A few days after our new CEO at work arrived last November, he held a company-wide meeting. He told us about the time he spent in the athletic department at UC Berkeley, working with the rowing team. “When we had one or two superstars who were great, we’d never win championships. However, when we had a team full of very good but not great players, and they all worked together in rhythm, we’d win.” That’s the problem with the Tigers. We have a team full of superstars who lose because they don’t work as a team. It reminds me of the Tiger teams of the mid-90s. What I am about to say is nearly sacrilege in this town, but I was never a huge fan of Larry Finch as a coach. I thought he did an incredible job recruiting and a poor job getting the best out of the players he recruited. (Sound familiar?) Year after year I’d watch as Nolan Richardson would take an Arkansas team with far less raw talent deep into the NCAA tournament, whereas Memphis would be early-outs if not relegated to the NIT. Coach Richardson knew how to maximize what he had. But wait a minute… didn’t we have a team full of superstars when Calipari was here? What’s the difference? I think Calipari knew how to communicate to his players that this is a business. All five of the current Tiger starters, plus Antonio and Shaq and maybe one or two more, are talented enough to make some money playing pro ball after college. I’m not saying they’ll all get to the NBA, but they’re all good enough to get contracts in Europe or China or D-League. Cal would tell them, look, you put your ego aside and do what I say and I will show you how to maximize your future earning potential. 1) Stop using the all-Memphis starting lineup. Yeah I know it’s a feel-good thing for the city, but it makes them want to show off for their homies. From the games I’ve watched on TV, the mood is different when Antonio Barton (from Baltimore) or Shaq Goodwin (from Atlanta) subs in. It’s not that they don’t have fun – I love the big smile on Shaq’s face when he’s playing – but they look for their teammates more. Get that energy going from the start. 2) If you choose not to cuss at your players, that’s all good. That’s your style and you shouldn’t feel like you have to change it. But, one suggestion: Stop referring to your players as “young men.” It sounds like you think they’re all Eagle Scouts, or aspire for them to be. Eagle Scouts don’t win NCAA championships. So there you have it. I’m sure JP was just waiting to hear from a blogger who hasn’t touched a basketball since the 1980s, and who dedicates a 41-day-long month to tube tops, to tell him what to do with his team. All right, enough of that. Let’s get on to the news. It’s Blues Saturday Night at the Center for Southern Folklore. At 8 PM Billy Gibson will get things started with his classic blues sound. At 9:45 fife player Sharde Thomas takes the stage. She’s the granddaughter of the legendary Othar Turner. Tickets are $7 in advance or $10 at the door. 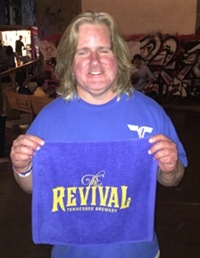 Around the corner, Memphis jam band FreeWorld takes the stage at 9:30 tonight. FreeWorld recently earned their note on the Beale Street walk of fame after 25 years of hard work. Shows at the Saucer wrap up about 1 so you easily have time to catch the entire Center for Southern Folklore show and then FreeWorld’s second and third sets. I’d say that’s about as good as a Memphis Music 101 as you can hope to get Downtown on a Saturday night. There’s no cover for FreeWorld. Over at the Orpheum, there’s the All-Star Comedy Jam. It’s hosted by Gary Owen, with “The Gangsta of Comedy” Capone, “The Comedians’ Comedian” Tony Roberts, and “The African King of Comedy” Michael Blackson. Spinderella is the featured DJ. More info on this show here. Back to the Grizzlies for a minute… huge respect points to part-owner Justin Timberlake for dancing along with the Grizzlies Grannies and Grandpas last night. I’m a huge fan of the over-50 dance team that performs during game breaks. All right, time to jump in the shower. Going to hit Panda Manda’s bar at 11 then head down the street to do some more tutoring about trapezoids, rhombuses and parallelograms. Plans for tonight TBD. Thanksgiving weekend and not much is going on. I’ll do the best I can but this post won’t be a long one. RedRover Sales & Marketing, one of Downtown Memphis’ best companies, has a Public Relations Account Executive position open. The Memphis office is located at 415 S. Front, so one of the perks of the job is that you’d be able to walk to Gus’s for lunch. There will be a “Do Good with Food” party Tuesday night, November 27 from 6 to 8 PM at 514 S. Main. The party will benefit the Mid-South Food Bank. They are asking attendees to bring non-perishable proteins. On Friday, November 30 there will be an Unveil South Main party at Jack Robinson Gallery, 44 Huling, from 5 to 7 PM. Twenty artists have been selected to have their work on display at South Main restaurants and retailers from November 30 to December 19. The party at Jack Robinson Gallery will honor all the selected artists, then from 7 to 9 there will be parties for the individual artists at their respective exhibit locations. Learn more about the artists here. Tigers game last night was painful to watch. My suggestion would be to start Antonio Barton in place of Joe, and Shaq Goodwin in place of Ferrakohn Hall. Or if you want to start someone who has been around and worked hard enough, long enough to earn a starting spot, D.J. Stephens in place of Ferrakohn Hall. And tell all the guards to stop jacking up so many threes and get the ball inside to the bigs more. Really, though, I’m not sure if any of that will help. On our first possession, when VCU’s defense was all over the Tigers and they couldn’t respond, I was pretty sure we were going to lose. If you want to see winning basketball, there’s this team called the Grizzlies who play at the FedExForum tonight. They play the L.A. Lakers. It’s Black Friday. I hope you slept until 10 AM, and now you’re getting up to go shop at a locally-owned merchant. I have already got the majority of my Christmas shopping done and I did it in less than a five-minute walk from my front door. Right now, I’m headed out to do some ACT math tutoring while drinking beer.